This was the first console title I ever owned for the first console I ever owned. It came packaged in and as soon as I opened it I plugged it in and immediately began playing. I remember on my first try though I picked Max, because he was the toughest and buffest looking character of the choices. I got the three-button control scheme pretty quickly and soon succumbed to a Game Over screen before I had even beaten the first section of the first level. My next major memory of the game was in co-op and how a friend and I learned the lesson of friendly fire and collateral damage. We divided up the screen; he would take the top and I would take the bottom. We also divided the health and money as evenly as the game would allow. We could never agree on weapons if there was only one. Finally my last major memory of that era was late one Sunday evening when I finally made it to the 8th stage again and after much effort and bad beats I finally finished off the last boss and got that stage clear. I cheered and hollered and jumped up and down. After the closing cut scenes and credits I was presented with the top scores board and then the Press Start to Play screen. A while back I located, setup and plugged in that game and found none of it had left me. I still understood the tricks to beating certain bosses. I still remembered the timing to do infinite punches and most importantly I still remembered where most of the secret 1up items were. 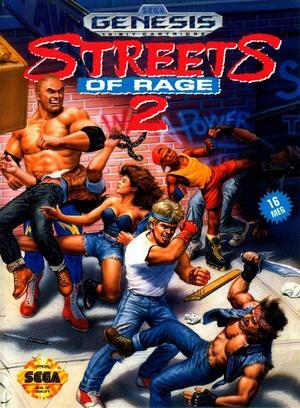 There are few games I know as well as I know Streets of Rage 2. Thanks to the Genesis collection I can play it whenever I want and in HD. I get excited whenever I hear the “dun dun duh duh de dun duhh eh eh” 80s style riff of the opening level. In looking back what I find interesting was my initial reaction to the game. Or rather how I responded to what it presented me. The opening that sets the scene is done in showing a pixilated NYCish city in the background and a text scrawl that is the story ala Star Wars. It ends with an evil mastermind’s face and hands appearing like a puppet master over the city. I ignored the text. I ignored the story. I had no idea what was going on and who I was. All I knew I learned from the gameplay. I was the good guy and everyone else was the bad guy. That’s all you really need to know as the entire game plays out like an extended final fight scene in an 80s action movie with all the first and second acts that would take up screen time done in the opening crawl. Later play-throughs I would skip that text crawl section entirely, until I beat the game that first time. The next time I sat down to play I stopped and read the whole thing. I didn’t fully understand, I was 8, but I actually cared about the story after having seen the ending and wondering who that extra character was they rescued. I saw the resolution and then I wanted to know exactly what was resolved. Even as fantastical and unbelievable the story sometimes seemed to be getting, the details in setting forced the player to fill in the blanks about what was going on. More than any other game Streets of Rage 2 introduced me to the concept of video games as a narrative medium. I didn’t understand it like that back in, but from then on I always wanted to know why I could or was doing something rather than just what could I do. 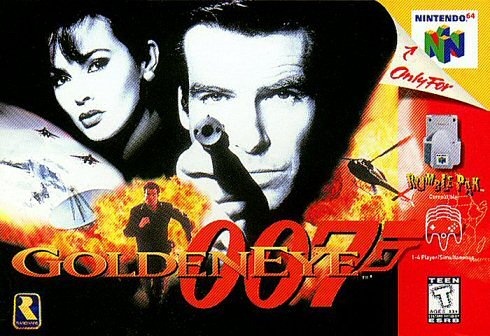 Arguably the best movie to video game adaptation ever made, this set the original standard for FPSs on the consoles and where nearly all of my video game hours during middle school went. I beat the game on easy and then spent years trying to beat the levels on the higher difficulties. I would use the train level as others use a stress ball after a bad day at school. However, that is not where most of my time went. Most of it went to the multiplayer. Because of its multiplayer this is probably the game I have sunk more hours into than any other. Three friends and myself would all sit in front of the same screen shooting the hell out of each other at my house, at a friend’s house or at the local youth center. I like many others got the N64 blister working that analog stick. Many games have had same screen multiplayer. What did I gain from this one in particular? I could call it a version of emergent storytelling. The same four people would play over and over. Eventually we developed favorite levels and favorite weapon stocks.Â Soon we found our favorite match: proximity mines in the Aztec Temple with no time or kill limit. Beyond that we began choosing the same avatars and for every kill some of us supplied our own catch phrases. “I spit on your corpse” and “I am the lion in the jungle” were two of them. We had our own personalities in these death matches. We never got bored of playing essentially the same match over and over, because it would never be the same match. The moment that remains in my mind to this day is where the game had been going on for a long time; I’d like to say an hour or so. The entire map has been littered with mines and if the game had destructible environments it would not be standing anymore. I stocked up on proximity mines in the large upper hall, planted a few more around and then realized I could not move without dying. I couldn’t go forward because of the mines I just planted and I couldn’t go backwards because of mines planted by others maybe 20 minutes ago. I saw one of the doors open on the far side and silently said ‘no.’ He entered and was instantly killed by the explosion. That explosion was followed by another and another and another. He had set off a chain reaction that crossed the entire hall. Just before it hit me I tried to escape and died a fiery death. That sort of thing cannot be planned and have the same effect. We were amazed and then kept on playing. Yes the game’s graphics don’t hold up that well, but it was a milestone and everything else about the game does. Last year my friends and I went back to the game and dumped a few more hours into it. We tried a few new modes and weapons. It was still as good and as fun as ever. This is the grand daddy of them all. This is my all-time favorite game. It is also the best video game RPG ever made. But this about influence not quality. I dumped a lot of hours into this game as well, the big difference being that I’ve never beaten it, nor even come close. The game has so much content that I had to go off the beaten path and explore every section into the farthest wiles and deepest depths of danger and death. I went to the absolute limits of the map boarders. I went through every nook and cranny exploring every part of every map. I would uncover dangers I could not handle, run away or reload and come back, when I was ready so I could continue. 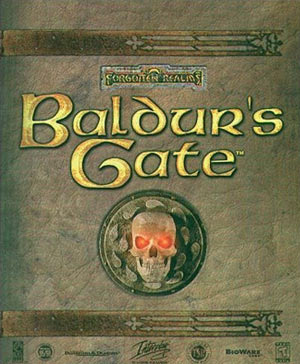 This is the first video game to create such a complete world, one that seems to live and breath with so many unique characters. Even the repeatable no name citizens seem to adequately fill the world. What I love is unlike so many others are that the story allows such exploration. There is no immanent end of the world. The story is epic, but it is very personal. People are after you and you have to hide from them/fight them. Only you and your party care and some of the party members don’t even care about you and are there just for their own agendas. No one else in this world is invested in you. They have their own problem and their own lives. There are also references to an even wider world that extends the very large boarders of the world to locals like Amn, Waterdeep and Neverwinter. I was pulled into this world like no other game before it. After reading that there was no way I could not choose it. It’s a line that I make a point to keep memorized. The old man’s response went along the lines of: “Well if that’s how you’re going to be.” He went on to give one last fact that made utterly no sense. Until I read some book on a random shelf and what he said clicked. It sent a chill through me. It is that kind of interconnectivity that you just don’t find just anywhere or I think even anywhere else. Nevermind that the dialogue choice is itself the best critique of the RPG and fantasy genres ever. I often find myself wondering why a game doesn’t try a morose and utterly depressing character choice? Why isn’t there a character who isn’t happy to see adventurers? Why isn’t there a quest that solves itself while you look on? Why does everyone have to know you are the hero and not some shulb? Or a quest where the quest giver doesn’t want you to complete it for non malevolent reason? And then each time I come up with something I stop and realize whatever example I was lamenting about had already been done in Baldur’s Gate. It was just so big and full in my eyes that despite any problems I felt like there was a world there I could live in if I could crawl into the screen. I scoured my memories trying to figure out what games effected me in some way. The ones that influenced the way I react to them or even those that shaped my current tastes. I remember games lost to time. I remember games that probably wont show up anywhere on the internet if you do a search. I thought I knew what the first video game I played was, but going further and further back I realized how long video games have actually been apart of my life. I remember Win 95, I remember the autumn leaves wallpaper of Win 3.11 that I could only get to through a DOS command. I remember my Genesis, I remember my Game Gear, I remember my earliest electronic tutors and yes even my family’s Apple II in all its black and green glory. From King’s Quest VI to Myst to Doom to Wolfenstein 3D to Pixelart to Reading Rabbet. I remembered so many games I’d forgotten about and the time spent with them. It was wonderful sitting down to figure out which games stuck with me, which ones my mind thought deserved to be remembered and which ones Made Me. One Response to "Gaming Made Me"
HEY! The 3.1 Autumn Leaves pattern! I hadn’t remembered that in many a year, but I loved that pattern. It was the only vaguely exciting thing in 3.1.